Flashback Theater Co. Celebrates Five Years at Annual Cabaret | Flashback Theater Co. The 2019 season of Let’s Play! 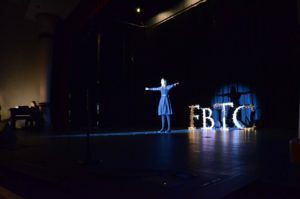 at Flashback Theater Co. (FbTC) continues this April with the 5th Annual Season Announcement Cabaret. Sommer Schoch, the Producing Artistic Director, will announce Flashback Theater’s next season of shows during an evening of performances by local talent. The showcase will begin at 7:00 p.m. and will take place in the Black Box Theater. Audience members are encouraged to make a donation at the door of this event as there is no admission price. Audience members of all ages are invited to attend. Refreshments will be provided by FbTC’s board members and Jarfly Brewing Co. will be on site with a cash bar. Since 2015, the Season Announcement Cabaret has been FbTC’s annual event to celebrate the artists and audiences that make it possible to do theater all year long. Since being founded in December 2014, FbTC has produced 11 shows and made arts education accessible for all ages with the Let’s Play! program. In 2017, the theater company moved into the former City Hall building and created their Black Box Theater, which has helped the local theater company to gain artistic momentum and visibility in the community. While the Cabaret is a celebration of all that FbTC has accomplished in the past five years, it is also a chance to build excitement for what lies ahead. Between performances of local theater artists, the 2019-20 season at Flashback Theater will be announced. Audiences will get a glimpse at next season’s Mainstage productions, Let’s Play! Workshops, and New Play Development projects. The Cabaret is an opportunity for local talent to stretch their performance abilities each year. Performers are encouraged to choose material that they are personally excited by and may not get to perform otherwise, which results in a unique evening of artistic expression. Once selected, each act is given complimentary coaching time through FbTC’s partnership with McNeil Music Center. Many featured performers are Flashback Theater veterans, but audiences can also expect to see new faces in the mix. Every year the Cabaret proves to be an exciting and dynamic event, and this year is no exception. Join Flashback Theater in celebrating five years of productions by attending the Cabaret on Saturday, April 13 at 7:00 p.m.
400 East Mount Vernon St.